History has always been shaped by movements for social justice. 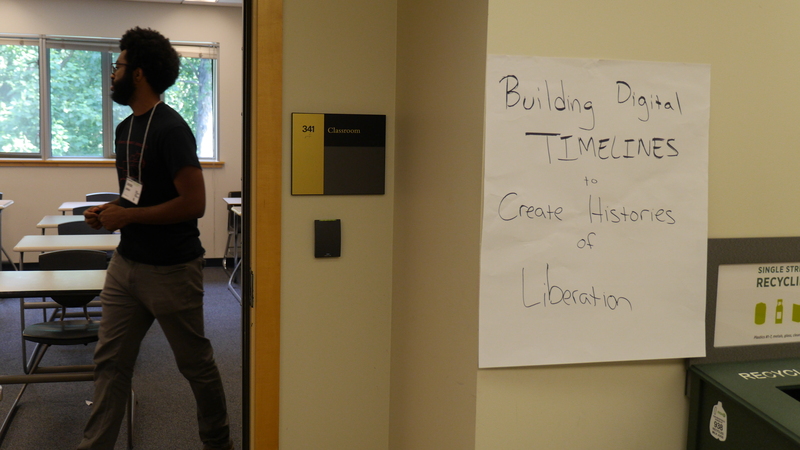 The Movement History Timeline is an interactive tool that links our personal stories, our songs, our images, our media to larger histories of social struggle and popular movements for justice. The timelines below represent a few implementations of the Movement History Timeline. They should be viewed as concepts and the user should feel free to innovate on their use! Each MHT workshop is designed to stand alone but we encourage you to use them all to get the most out of the curriculum. We also strongly encourage you to download Global Action Project’s Workshop Principles & Facilitation Tips PDF on how to create a productive, safe and creative space for exploring issues, working together, and making media. If you choose not to review our broader document, consider referencing these very basic elements listed below – they will help support your use of the workshop. “Safe Space”: Create an atmosphere in the group that maximizes everyone’s comfort level and that is determined by the youth together. This supports collective ownership of the space they will be part of and work in creatively. Safe Space includes agreeing to disagree, confidentiality, respecting each other’s ideas and the right to choose not to answer a certain question. Ground rules are set by youth at the beginning of a new group to help to set the tone for a safe space of mutual respect. All voices heard: Encourage active participation by all in the group. Direct but do not dominate discussion. Educators should have clear goals but adapt to, and be sensitive to needs and interests of individual youth and the group as a whole. “One Mic”: State that one person speaks at a time. When people talk over each other, it causes the group to lose focus. The facilitator or any group member can say, “one mic” to remind people to take turns. Collective work: The youth work as a collective. The facilitator is there to guide the youth through the production and analysis of their media. Every effort is made to include everyone and incorporate individual ideas. Compromise is essential when working in a collective. People learn through collective processing, discussion, making, and reflection. It is really important to set the tone for the program early on to create a productive working space for the group. This activity enables facilitators to be clear about organizational expectations and principles and give the group a chance to determine how to work together productively moving forward. Facilitator(s) take a couple of ideas and write them on newsprint. SAFE SPACE is an environment where people feel comfortable and respected, and are able to dialogue, debate, and work constructively together. Get a few responses about why the young people think Safe Space would be important for this process. Ask for a volunteer to lay down and have his/her body outlined on butcher paper. Give everyone a minute to think about what type of behaviors and attitudes would be helpful to create a safe space for the group. Then one by one, have each person write INSIDE the being, the word/s they came up with (allowing time for clarifying questions). After everyone goes around, have them think of things that may get in the way of the things listed inside/ attitudes or actions that they don’t want in the group. Ask them to write those words OUTSIDE the being. Check-in to see if there are any more clarifying questions. Make sure the group has an understanding of the words. There may be some words that folks have differing meanings for; in this case, try and come up with a collective definition of the words. When everyone is on the same page, you can have participants sign their being (and name it!) and put it up in the space so that the group can refer back to it as program goes on. What is Media? What comes to mind when you think of Media? Let’s brainstorm different types of media and I’ll write our responses on this large chart paper. 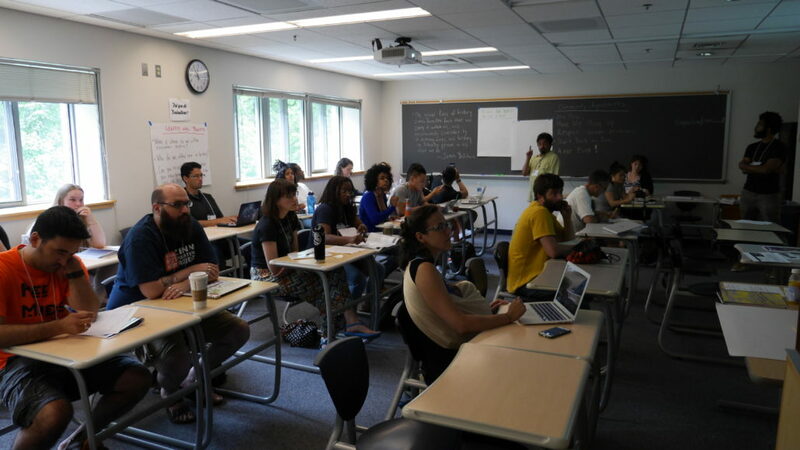 Facilitator writes responses, which may include : Movies, Comic Books, Radio, Graffiti, Video games, Websites, …. Great! We have some good examples of different media. Now for the second part of this activity we’ve posted signs on opposite end of the space, one that says AGREE, and one that says DISAGREE. Let’s clear the space between the two signs, and have all participants stand in the middle. Now, I’m going to make a statement. And then you are going to put yourself somewhere on the imaginary line between the AGREE and DISAGREE signs. This line is a spectrum, its not black and white or either/or, so you can indicate how strongly you agree or disagree with the statement by where you stand on the line. The ends of the line (where the signs are) represent very strong agreement or very strong disagreement, and all of the space in between the signs represents degrees of agreement. After everyone has found their place on the line, I’ll call on people to explain why they’re standing in their spot. People will have an opportunity to respond to each other. Listen carefully to what other folks are saying. If you hear something that makes you re-evaluate where you’re standing, move to a new spot on the line! After folks take their position, ask for why they’re standing where they are. Ask if anyone wants to change their position after hearing what someone said. Again after participants take their position, facilitator asks why they’re standing where they are and if anyone wants to change their position. What did you notice about people’s responses to the Spectogram questions? Was there a lot of movement across the room? What are you taking away from the Spectogram activity? An activity that uses a competitive game-like format to allow participants to comprehend how media consolidation impacts the type of media we watch, listen and read. Game Board: Large-size paper or newsprint with media ownerships questions written out. Questions can be pre-written in the rows & answers from Team A, B, C,etc…can be written in the columns. We’re going to do an activity to help us think about the impact media consolidation may have on our communities. Here’s how we’re going to play the game! We’re going to divide the group into 2 teams (more, depending on group size) – We’re going to count off! This is a RELAY RACE, so remember to run up to the Game Board and use the markers to write your answer. Please let your team know if you are unable to run. Remember to send a different runner up each time, unless someone is unable to. When you write your answer, hide it afterwards from the other teams. We don’t want any cheating! In 1983, 50 companies dominated most of every mass medium (television, newspaper, books, movie & magazines). Today, how many dominant corporations are there? The Telecommunications Act of 1996 changed the laws of media ownership. Does anyone know what media consolidation is? Definition- Media Consolidation: a process whereby fewer individuals or organizations control shares of the mass media. Now 6 major corporations control 90% of what we watch, see and hear! One company alone, Clear Channel Inc., owns 850 radio stations across the country. Before the 96 Telecom Law, a company could not own more than 40 stations nationwide. What do you think may be some of the consequences of media consolidation? Commercially driven, mass-market media that is primarily loyal to sponsors, i.e. advertisers and government rather than to the public interest. Of all the TV stations in the United States, what percentage is owned by people of color? Answer: 3% are owned by people of color, while they make up 40% of the U.S. population. This means that of the 1,348 TV stations, people of color only own about 43 stations. The number of TV stations owned by people of color has declined by 25% since 2006. Now, we’re going to talk about Internet media companies. As a team, write down your top 10 list of Internet companies and put them up on the media ownership chart! You can write either the type of business the Internet company is OR the Internet company’s name itself. You don’t have to put them in order. For example, write your top 10 as made up of: 5 e-commerce sites; 3 movie streaming sites; 1 social network and 1 news site. And that’s your top 10. Ok, get ready, now huddle in your teams and GO! Take responses from participants. Try and make sure everyone has a turn to respond. And highlight any patterns or commonalities found in responses. After everyone has had a chance to weigh in, thank participants and urge them to reflect on media ownership as they watch their favorite TV programs, listen to their favorite radio stations or read their favorite websites. How might the content change if a person of color or woman owned the media? 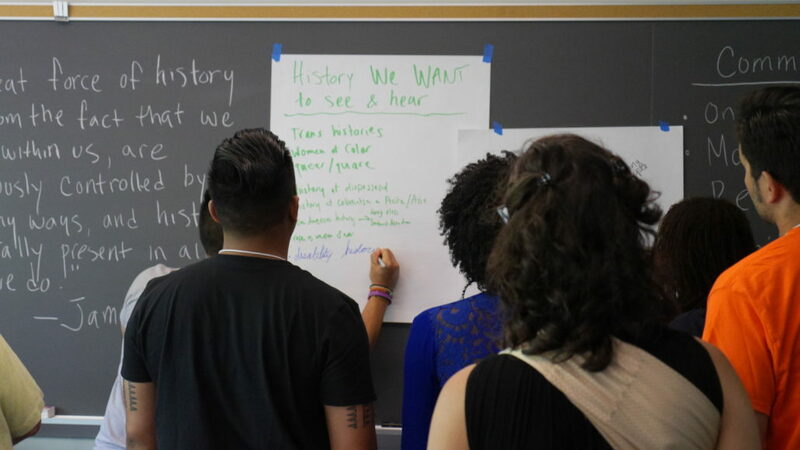 This workshop allows participants to think about identifying with a collective and to share different communities they belong to and identify their struggles and strengths to the group. This workshop opens up the space where youth can build community within the group as they find commonalities and differences with each other. Share what we’re proud of in our community(ies) and the struggles. Today we are using this activity to share a little about the communities we belong, to get a sense of where people are coming from, and what perspectives are being brought into the group. Depending on who’s in the room: Ask individuals what makes up a community. What comes to mind when you hear the word? Write Community in the middle of a newsprint and write down people’s responses. Here at GAP, we have our own way of saying things. What do people think of this definition? Now that we’ve defined what a community is we’re going to share what communities we belong to and their strengths. Pass out Handout 1: Community diagram. Each person will have 10 minutes to fill out. There will be newsprint and markers available to draw community map. Make sure to stress that no one has to share, but if someone feels comfortable they can show their community map. We want to give folks a few minutes to share what they wrote on their maps. You don’t have to share everything you wrote, or even show your map, if you like you can just talk about what you wrote. Does anyone want to share or talk about their community map with the group? Did you notice any similarities or differences in our community’s strengths and struggles? Why is it important to identify the strengths and struggles of our communities in our line of work (as media-makers, educators, students)? How does our participation in these communities affect our work as media makers/educators? What do you imagine to be the challenges facilitating this workshop with young people in your program? How would we address those challenges? To wrap up and evaluate our workshop, we’d like folks to share out their Pluses & Deltas. At GAP, we believe that evaluation and assessments are key elements to the education process. And the way we do that at the end of each workshop session is we go-around and people share their Deltas and Pluses. When we do this we look more subjectively and share what we personally could have done better next time. Its not about criticizing others, saying, “This person could have done this better.” But instead consider what I could have done better, not They could have done better. And for Pluses, again we evaluate what were some of your own positive experiences, what are we taking away from today’s training session. A hands-on “How To” for using the Media History Timeline tool, exploring the digital interface and the various tracks that make up the timeline. After explaining how to use the tool, a majority of workshop time can be spent by participants creating their own timelines. Go to: http://mediahistorytimeline.org/ to create a timeline. What is on the timeline? What do you see? –People’s Movement History: These are histories of large numbers of people coming together to fight back against injustice such as the Black Civil Rights Movement in the 50’s and 60’s, Black Power Movement of the 1790’s. What a lot of people don’t know is that these mass movements were largely started by young people! Can you think of any other examples from today (i.e. #BlackLivesMatter, Occupy Wall Street, etc)? –Personal Stories: Why do our stories matter? Take a few responses and affirm what folks share. Explain, in your own words, why our stories matter. When did you became conscious that media is powerful? Think back to this time, perhaps when you were younger or just recently, when media had an impact on you. You can answer this in a general or specific way, but try to write what year it happened. For example, when I was 14, I realized fashion magazines completely affected how my friends and I felt about our bodies. Another example could be: I realized that media had a powerful effect when the images of Rodney King being beaten by police officers unleashed an uprising in Los Angeles. (Give group a few minutes to think and write). Ask for volunteers to share their media stories. Take time to affirm responses and encourage shy students. Now, we’re going to create a sample Media History Timeline from these media stories people shared. Don’t forget to press “Save” so that it gets saved to the timeline! As folks are entering their media stories on their timeline they should look for historical moments that were happening around the time of your personal story? What might this say about their media story? Facilitator should float around room and assist participants as needed. Make sure participants copy the link to their timelines so they can continue to build their timelines after the workshop has ended. We’d like to wrap up by everyone sharing their Pluses & Deltas. Has anyone used Pluses and Deltas before? We believe evaluation and assessments are key elements to the education process. And the way we do that at the end of each workshop session is we go-around so people can share their Deltas and Pluses. When we do this we look subjectively at our Pluses & Deltas. For Pluses, we evaluate what were our own personal positive experiences, what we are taking away from today’s training session. For Deltas, its not about pointing the finger at someone else and saying, “They messed up or they could have done this better.” But instead consider what I could have done better, not They or Them. Before we begin, can someone please take on the role of Scribe and write notes on this large piece of paper? If no one volunteers, facilitator can share their pluses and deltas first. 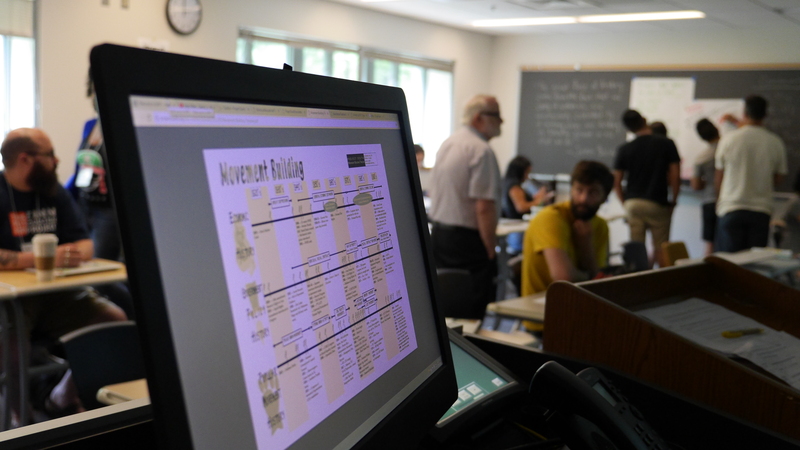 The photos below showcase workshops, conferences, and meetings where the Movement History Timeline tool has been shared and evolved! Your message will be forwarded to the organizational partners Global Action Project, Project South, and Research Action Design.